Banksy, the British artist and writer whose identity is still unknown, is considered one of the leading exponents of contemporary street art. His works are often satirical and deal with universal themes such as politics, culture and ethics. The aura of mystery that, from choice and out of necessity, is perpetuated whenever Banksy is mentioned has turned him into a mythical figure of our times. His visual protest engages with an enormous and heterogeneous public and makes him one of the best-loved artists among the younger generations. Various exhibitions of Banksy’s work have taken place in art galleries, but until now no public museum has ever given the artist a solo exhibition. The MUDEC – Museo delle Culture in Milan is pleased to present for the first time a solo exhibition of the British artist’s work. “The Art of Banksy. A visual protest”, at the MUDEC from 21 November 2018, curated by Gianni Mercurio and MADEINART, unites under one roof for the first time more than 70 works, including paintings, sculptures and prints by the artist, and accompanied by objects, photographs and video, to take a retrospective look at the work and philosophy of Banksy. The itinerary adopts an unusual and, in its own way, an academic approach in keeping with the mission of a museum such as MUDEC to provide every member of the public with the key to understanding (and appreciating) the cultures of the world and the major themes of contemporary life through all the visual, performing and sound arts. The exhibition has not been authorized by the artist.Promoted by the Comune di Milano-Cultura and by 24 ORE Cultura-Gruppo 24 ORE, which is also the producer, “The Art of Banksy. 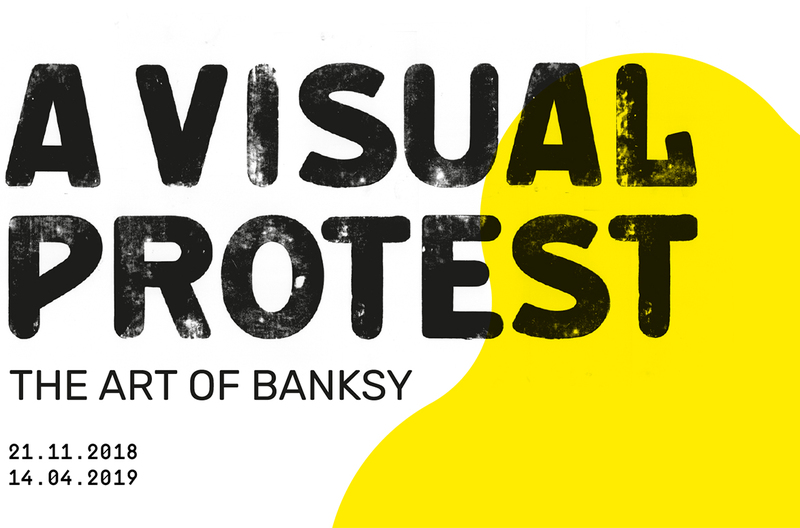 A Visual Protest” is divided into four sections to aid critical reflection on Banksy’s present and future place in the wider context of art history. The “movements” that gave rise to visual forms of protest are related through video-installations in a fusion of words and images, dominated by Banksy’s tendency towards action, as explicitly referred to in his chosen mode of expression. The message and the poetry underlying the series of works known as “Modified Oils”, in which the artist blends genres and periods, are investigated using copies of often universally recognized existing works, but with the addition of some alienating elements. Banksy’s preferred technique of stencilling is examined. He perfected this technique with the two-fold aim of being able to create illegal works at great speed and at the same time get more detail into them, creating high-contrast images, usually monochrome or bichrome, sometimes with the addition of colour to certain details. Banksy’s murals are shown (through photographs and video) in their original locations across five continents. The genius loci (spirit of place) is a key aspect of his work. A fundamental component of his extraordinarily creative and irreverent work is its relationship to the human landscape in which the artist expresses himself, often in areas of conflict where politics and institutions struggle to be seen. There is much speculation about his name and his identity. He was born and grew up in Bristol, but apart from this little or nothing is known about him: it is impossible to find out the details of his life although many have attempted to do so. Gianni Mercurio, curator of the exhibition, recalls how one characteristic the “writers” of yesterday (the artists who in early seventies New York sprayed the first graffiti on the exteriors of the subway carriages and later on the walls of the New York stations) share with today’s street artists is their multicultural origins. The first writers “came from various New York neighbourhoods with diverse communities (the blacks of Harlem, the Hispanics and Italians of the Bronx and the lower East Side). It is no accident that the primary effect of their expression was the invention of a new style of writing that previously didn’t exist, an amalgam of many lettering styles from Arabic script to Western and Asian scripts. In this panorama” Mercurio states, “Banksy amplifies and expands the multicultural character of the “writers” who initially formally inspired him: like the street artists of his generation, he accentuates the content of the socio-political messages in an explicit way, indeed he radically shifts the message from the form to the content”. His message, his art, manifests itself as an explicit and scathing criticism directed at the arrogance of the establishment, of power, conformism, war, and consumerism.